It’s Pi Day Peeps!!! That means all over the world smart people will be celebrating pi (π). The even smarter people will be celebrating with PIE!!! 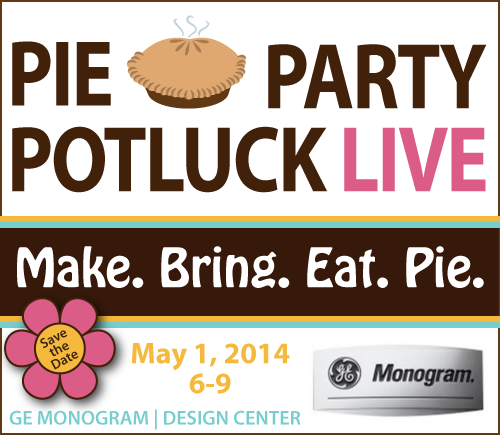 It’s the perfect day to officially announce the SAVE-THE-DATE for Pie Party Potluck LIVE 2014 that will take place at GE Monogram Design Center on May Day, May 1st, 2014. So you can use pi (π) to measure pie, at least pies that are circular. BUT pies come in many shapes and forms including: tarts, galettes, pop tarts, hand pies, quiches, empanadas, turnovers, pasties, pizza, tartlets, strudel, pie in jars, pie-lets, etc. 1. a baked dish of fruit, or meat and vegetables, typically with a top and base of pastry. Pie Party Potluck LIVE 2014 is an industry-only event for food bloggers, food writers and food professionals. Check out sea of pies in our past pie party videos and recaps with links to the “droolicious” lists of the pies people made for the events. Want Your Product to Reach 60 Food Bloggers and Food Professionals? Sponsor Party Potluck LIVE 2014 and get your product could be talked about, tasted, listed, blogged, linked, Facebooked, Google+‘d, tweeted about, etc. ?